Come on an adventure of discovery - somewhere a little "off the beaten track". Explore the rambling countryside, with all its treasures, tucked away in the Margaret River region of the south west of Western Australia. 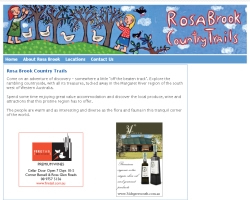 Rosa Brook Country Trails is a guide to driving through the localities of Rosa Brook, Rosa Glen, Bramley and Osmington.